I never realized how much I missed soup until last night. Soups are one of my favorite dishes, and I don't have them enough here in Boston. I grew up with large three-course lunches. Soup followed by meat and side, followed by dessert; dinner on the other hand would be just a simple quesadilla or a bowl of cereal. When I came to the US I had to adopt a whole new way of eating, scratch that, I am still trying to adopt it. I am slowly adapting to the small-lunch-large-dinner way of eating, but I still find myself confused when its mid-afternoon and I'm suddenly starving since I had a small lunch. Anyways, there's two reasons why I don't have soup as much here as I do at home. First of all, soup takes a while to make. It's not very hard to make, but it takes time and organization. And then there's the fact that I'm not used to having a large dinner. Its weird enough to have a large dish for dinner, and adding soup to the mix just confuses me even more. But yesterday I found the solution: soup can be a meal on its own. 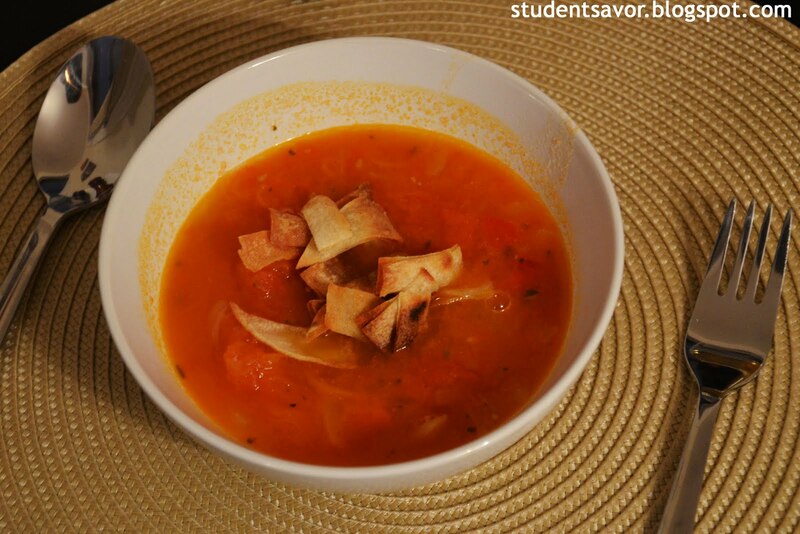 I am happy to say that after my success making tortilla soup yesterday, you will be seeing many more steaming bowl of soup around here from now on. Ok, so now the specifics. The roomie was craving tortilla soup last night, so I grabbed my How To Cook Everything book and looked it up. Yes, I know I should've just called my mom and asked her for a Mexican recipe instead, but the book was so convenient and it definitely paid off. The recipe is pretty easy to follow and with a few tweaks it turned out to be just like a traditional sopa de tortilla. Preheat oven to 500 F or turn on broiler. 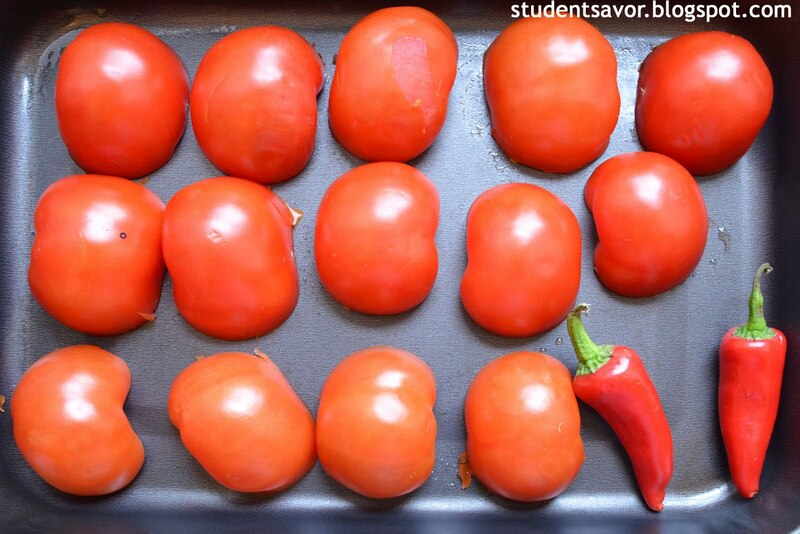 Place chiles and tomatoes on baking sheet and roast until charred. Flip over and roast again, about 15 minutes total (if you don't have a broiler). Remove from oven. Once cooled, remove seed from chiles and chop. In a large pot heat oil over medium heat. Add onions and shallots and cook until golden and soft, about 5 minutes. Add tomatoes and chiles and season with S & P.
Mash tomatoes with the back of a spoon (wooden preferably) and stir to combine. Add chicken stock and adjust heat so that soup simmers. Cook for about 20-30 minutes while simmering. Serve hot with tortilla strips, sour cream, and cheese. Preheat oven to 400 F. Stack tortillas and cut into 1/2 strips. Cut strips again so that they are about 1 - 1 1/2 inch in length. 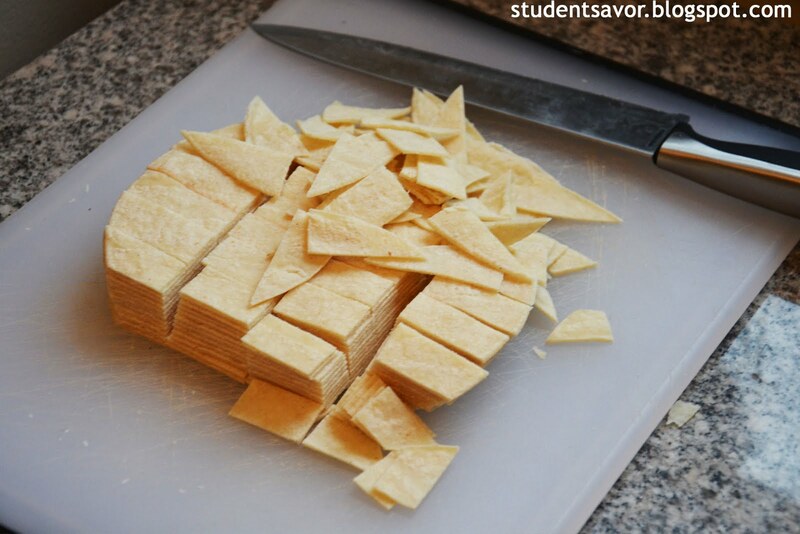 Place tortilla strips on rimmed baking sheet and spray with cooking oil. Cook in oven for about 10 minutes, shaking and rotating baking sheets halfway through. Let cool and serve with soup.